There are tremendous opportunities to combine fundraising with a hobby or interest you love. Whether you play a sport competitively or simply love watching your favourite team on telly, there are many sport-related fundraising ideas to get people involved in charitable fundraising activities. Sponsored Swim – Swimming the English Channel is the most famous sponsored swimming feat, but you can also swim laps in your community pool or take a dip in a famous river or lake. Sponsored Bike Ride – Cyclists have a variety of road and off-road courses at their disposal, taking them the length and breadth of the country. Choose a course suited to your ability and start pedaling! Sponsored activities are great for fundraising because they can be organised for people of all ability levels. Seasoned athletes can choose a monumental sponsored activity, such as cycling across the country or running in a marathon, while weekend athletes can do sponsored activities, too, pared down for their own abilities. Whatever sponsored activity you decide to undertake, make sure to practice and train before the big event. Depending on your current fitness level and the activities you plan to do, this may take several months. 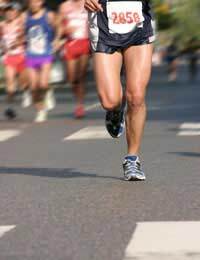 Set a clear goal, such as competing in the London Marathon, and begin preparing far in advance. The more you do in preparation for your big day, the more successful you'll be! Charity Boxing Match – Find your town's best boxer and go toe-to-toe with him in the ring. Take pledges for how many rounds you'll last; all you have to do is stay on your feet! Football Shoot-out – Involve your local football club in a sponsored match or charity shoot-out. Depending on the number of participants, you can collect donations for every goal scored, or every professional shot you can block in goal. Football Kick-off – Take pledges for the maximum distance you can kick a football (for example, 50p for every 10m). Get your friends and family to take part, too, and see who has the best kick. These activities work best for casual athletes but, as with sponsored activities, you can plan your challenge based on your ability level and the pro or semi-pro participants willing to take part. One of the best sport-related ways to fundraise in your community is to involve a local athlete or team in your efforts. Anything they do – from a charity sporting event to an appeal on their team's website – will gain a lot of interest and funds for your charitable cause. If you don't already know a famous athlete, phone up your local team's Public Relations department or the athlete's agent. Many teams have a specific person who deals with all enquiries of this type. You may need to make a quick pitch for your cause, so be ready! Explain your charity and the way you'd like the athlete to help, making sure to emphasise how their involvement would help their standing in the community, too. Taking up a sport-related fundraising is a fantastic way to combine your own interests with charity and fundraising. Not only are you using your own interest in sport to your advantage, but there are also sport fanatics in nearly every household, supporting a wide variety of teams and athletes.